Bigg Boss contestant Sangram Singh sppeared out of nowhere a couple of years ago. He is being "advertised" as an international "wrestler" in the media. In the Bigg Boss show, he is being advertised as some national sports hero who overcame loads of difficulties to "achieve" what he has "achieved". He even bragged on the show to a housemate that he was awarded "the Best professional wrestler in the world". So I tried to find out about this guy. I'll try to put my findings here. 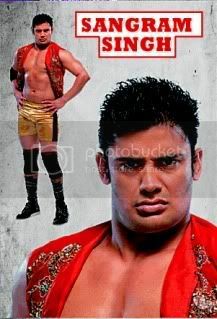 The first google search about "Sangram Singh" shows a photograph of him dressed in a costume and the words "Sangram Singh" on the image. Somewhat like a character from those phony "professional wrestling" "federations" like WWE, TNA etc. Wikipedia entry says his real name is "Sanjit Kumar". So, that's fine, he is a wrestler who has a "professional name "of Sangram Singh, so what? Next I go to his official website, sangramsingh.com. In the awards page, following achievements are mentioned, and I'll elaborate on each one of them. 1) World Best Professional Wrestler awarded by world professional wrestling federation in 2012. Google search "world professional wrestling federation" yields NO OTHER results apart from a few mentioning "Sangram Singh". So what is this "world professional wrestling federation"? Some further research yields that the character "Sangram Singh" is actually from "World Wrestling Professionals" or "WWP" is a South African wrestling "promotion". Their official website has his mention. The website promotes him as "One of the greatest Indian wrestlers in history"! It is also mentioned that he was awarded "World's best wrestler" in 2011. So it may be that WWP was wrongfully mentioned as "world professional wrestling federation" and 2011 as 2012 on Sangram's official website. But this is not some sporting body. This is just an entertainment company like WWE. They have people play fictitious characters and fight. eg: "Undertaker" (WWE) is a character played by "Mark William Calaway" with a backstory that he had his soul in a bottle and whatnot. Similarly, Yokozuna in WWE was a character played by American "Rodney Agatupu Anoaʻi" who was portrayed as a Japanese Sumo wrestler who was a "Yokozuna". "Yokozuna" happens to be the highest rank in Sumo Wrestling. But the truth is that Rodney was not even a Sumo wrestler, let alone a Yokozuna. It was just a character he played. So I am guessing the same about Sangram Singh, that he is just an image created by WWP with a backstory of a wrestler from India. This one is a no-brainer. Commonwealth Wrestling Championships are held bi-annually. BUT, they happen in "odd" years, ie, 2005, 2007, 2009 etc. So there was NO commonwealth wrestling championship in 2006. They deliberately chose the year 2006. I can understand about the previous point, but this is strange that they have mentioned a "TOTAL LIE" on his official website. I couldn't search a reference for this anywhere. He hasn't mentioned about any medals, so I guess he may have been a participant. Cleverly mentioned as among "top ten wrestlers". I'll give him a benefit of doubt. So, I guess that he might have been an actual "wrestler" at some point in time, circa 2005 but not a noteworthy one. Google search "John Ritz Big Five International Tournament in Johannesburg" -Sangram, yields ZERO results. The only reference to this are with Sangram's name. Further research yields that there is a "Johnnie Reitz Big-5" open tournament in SA. It is organised by some club and is an open tournament. So he may have participated in that tournament and won a medal. This one is too vague. I mean what "President award"? Google search "President Award Sanjit" yields three results, his official website, his official facebook page and a webpage referencing his official website. So I guess this one is a lie too. But since "President Award" is a very vague name, given that India has hundreds of thousands of sports societies (some even registered in slums, infact any one a register a sports society just like a company), may be that some obscure society did award him that. But there is no reference. Exact same explanation as the previous point. Giving him a benefit of doubt, maybe some obscure outfit did award him that. Again, same explanation as the previous point. There is a "Rajiv Gandhi Khel Ratna", but he was obviously never awarded that. No reference. I am giving him a benefit of doubt as he may have been an actual wrestler at that time taking part in state level/national level etc. It mentions some "Sanjit Kumar Dangi". It meniones about him winning a medal in South Africa and being a 5 times Delhi champion, so I am sure it's talking about Sangram. It mentions about the "beach wrestling", which again is not real wrestling but "professional wrestling" like WWE. So I guess, while in the police department, he was taking part in those money making competitions without authorisation, and was sacked. I am not agains him personally, but this is against the traditional pehlwani ethics of India. If he was participating in such tournaments, it is almost for sure that he is not regarded well in the actual India wrestling circuit. Hence no mention anywhere. Covered in the previous point. No reference other that his official website. Some research and it turns up that there are MANY NGOs and societies which use this name for an "award". So it could have been some obscure outfit. He became "Sangram Singh" in 2010, so may have been a PR exercise. Again no reference. And this title too is awarded by many wrestling "societies". So again, may have been some obscure one. 13) No reference apart from his official page. No reference to who awards this title. May have been awarded by local akhadas in some "melas". No reference. There are zillions of youth associations in India. Again, could have been a PR exercise for the TV show in 2010. He was not amongst the "official" winners organised by the Body Building Federation. Might have been some obscure outfit. Anyone who knows about bodybuilding can tell that he stands no chance even in a district level contest. Not because he is out of shape, but he doesn't have the actual "bodybuilder's" body. My conclusion is that Sanjit Kumar Dangi trained in an akhada in his youth like tens of thousands in Haryana. Got a job in Delhi Police through sports quota. But wanted to make big bucks so started the gimmicky "professional wrestling". Was sacked by Delhi Police. Then finally managed to join WWP who created the "Sangram Singh" character. Then some PR agencies created his host of "achievements" and started projected him in media as some great Indian wrestler. He became a regular feature in reality shows and Bigg Boss is no exception. I am even starting to doubt that his "wheelchair" stories may also be fake, part of his "Sangram Singh" character and not actual Sanjit Kumar. You link provided another point to my blog. The mention on the wikipedia page is totally unreferenced. The reference page goes to a non-existant website, suggesting that it was added deceptively. If you check the history of the page (click on the top right side of the page), you'll see it has been added by a use named "Sangram Sanjeet". And on the user page of "Sangram Sanjeet", there is a warning, " Please stop adding unsourced content, as you did to Sangram Singh. This contravenes Wikipedia's policy on verifiability. If you continue to do so, you may be blocked from editing "
Now if you search for "Commonwealth Wrestling Championships", there are no reliable references and there is no mention of FILA official website. Also, there is a link to some championship being held in a hotel in Jalandhar, and in the winner's list there is no Sanjit. The entry in the wikipedia is FAKE and another attempt by Sangram's PR agency to create fake hype. Plese RE-READ the blog. I have NOT written that he didn't win the tournament. I am basically questioning the value of the tournament itself. And i would like to tell you that his childhood story of being on wheelchair for about 8 years is true because one of my very relative's daughter has been married to a guy of his village and very have come to know so many stories about Sanjit Kumar aka Sangram Singh. Thanks for the information. I may be true. I haven't written anywhere that it is a lie. I was only doubting it as it may have a part of the "character".